The Western Wall in Jerusalem, in the words and Yiddish accent of Issac Bashevis Singer, is "like any other Veilin Vall (wailing wall)." It is the only distinct and concrete holy place for the Jewish people. The site of the Western Wall is run by an ultra-Orthodox group of bureaucrats and rabbis who are dictating the life choices of all who enter. Pope Benedict XVI was lucky in 2009, to be allowed to visit the wall with his crucifix. The rabbi in charge of the holy places and the wall, Rabbi Shmuel Rabinovitch, claimed that just as the pope would take off his shoes when entering a mosque, he should take off his crucifix when visiting the holy Western Wall. It took some argument to explain to Rabinovitch the difference between the pope's shoes (orange Pradas by the way) and his crucifix. One is a clothing item, while the other is the essence of his identity. The rabbis did not mess with the Pope because the man has 1.5 billion troops. But they do pick on us, the Women of the Wall. Women of all Jewish denominations who gather for the last 23 years every month and pray together wearing a tallit (prayer shawl), singing out loud (as opposed to lips moving with muted voices) and attempting to read from the Torah scroll. Our group is unusual since most of the women who huddle in the women's section of the wall (12 m reserved for women as opposed to the 48 m reserved for the men's section) are satisfied praying without making a sound, without a prayer shawl and without coming close to a Torah scroll. But our group is wonderful because it's the only multi-denominational Jewish prayer group in existence at the wall and maybe in the world. We became sisters as we reached across our varied Jewish practices to celebrate the new month together. Our unique community is a complex exercise in sensitivity and mutual respect. It is therefore quite shocking that our group is seen by the powers that be at the wall as provocative and having no respect for the feelings of others. We have suffered verbal and physical harassment by ultra-Orthodox male and female onlookers, who are threatened by our practices, which, though complying with Jewish law, seem to them to be quite unusual and challenging. We have been a target of Israeli Police, who are ordered by the rabbi in charge of the wall to enforce his opinion that our voices, our pray shawls and attempts to read Torah are an unacceptable injury to the holiness of the wall and that we must be silenced and stopped. However in 23 years of praying this way every month, not one ultra-Orthodox attacker has been charged for spitting, cursing or assaulting the Women of the Wall. Similarly, none of us had ever been charged with breaking any regulation or law until recently. For the past few months, one, two or more of us have been detained or arrested at the holy site, mid-prayer. All of these investigations have thus far been closed due to "lack of guilt." 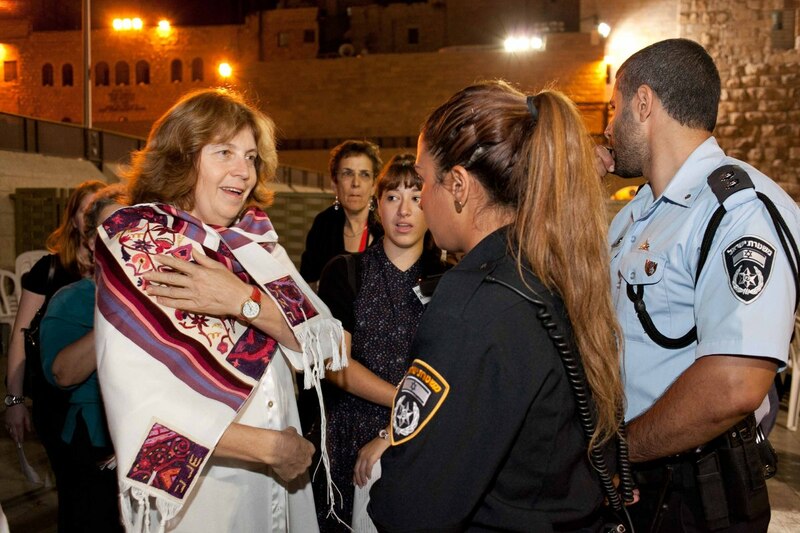 A few days ago, on Oct. 16, 2012, I was arrested at the Western Wall while conducting a prayer service in honor of Hadassah's centennial birthday. Two hundred and fifty Hadassah women came to the wall in solidarity with our group. As we were chanting the "Shema," a major prayer in the service, I was approached by a police office, ordered to leave the wall plaza and taken to the nearby police station. A night of humiliation and pain followed. I was handcuffed, strip searched, laid on the bare floor. I was not allowed to call my lawyer. I was dragged on the floor with my hands cuffed and worse of all, locked in a tiny cell with a crying young Russian woman accused of prostitution, who was the target of every filthy comment male inmates could utter. Her tears and their words are the hardest memory for me to move on from. I thought it was a cruel and unusual punishment, but as I found out it was cruel but not unusual. This is how arrests are done in my town, in Jerusalem. What is the purpose of arresting a woman, interrogating her, collecting video footage of her every move, questioning witnesses and spending hours writing reports, if at the end charges are never made? I believe the purpose of this harassment and treatment is to wear down the leaders of our women's prayer group, to exhaust us into giving up our struggle for this rights. If Women of the Wall are truly in breach of the law -- charge them. If they are not, stop arresting them, with release pending a 30- or 60-day ban on visiting the wall area or 5,000 NIS bail. It is time to demand that the state of Israel act like a Jewish and democratic state. Ultra-Orthodox rabbis may be offended by the Women of the Wall practices. That is their legitimate right but it becomes dangerous and frightening when the secular Knesset, the secular courts and the secular police bow down to the ultra-Orthodox fears and demands, while imposing them in the public sphere.